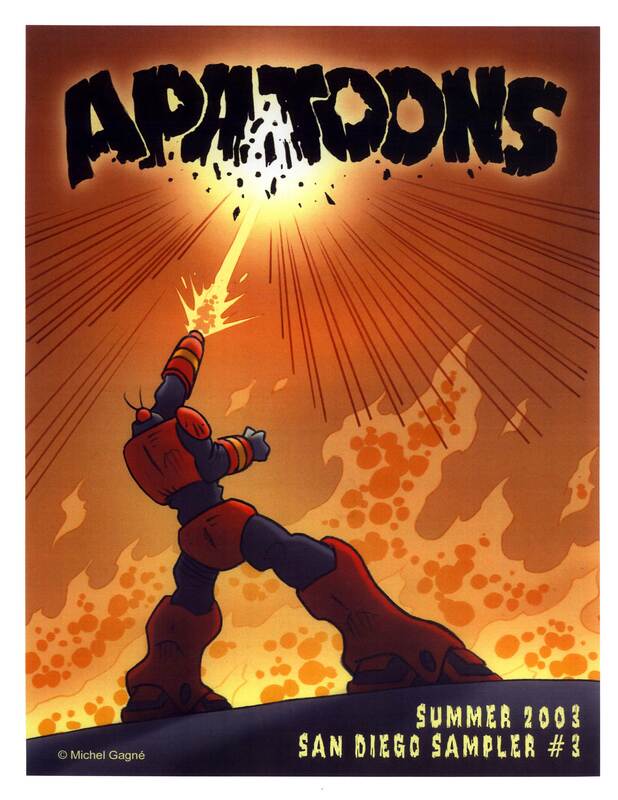 APATOONS is an Amateur Press Association devoted to animated carTOONS. APATOONS is for those who love animation, and who love to talk about it. We’re a private organization of some 20 fans and professionals with members from Australia, Canada and the United States. For 30 years we have exchanged information about cartoons past and present. Jim Korkis talks about the legacy of APATOONS here. Our group includes the finest in animation scholarship. The Apatoons Sampler, pictured above, presents many behind-the-scenes insights on animation, and is available to the public. Much of this information is available nowhere else. Rob Davies, Vice President of Development and co-founder of Atomic Cartoons, shares his insights on surviving in the animation business, pitching and networking. Bob Miller explores the history of Atomic Cartoons and how Davies established a successful independent studio. Simpsons director and Golden Age historian Milton Gray provides an informative tribute to Warner Bros. animation director Bob Clampett. He also salutes Coal Black and de Sebben Dwarfs. He addresses industry politics, our disappearing cartoon heritage, gender in animation, and a book review of Carl Barks Conversations. The amazing Disney historian Jim Korkis takes a look at Ralph Bakshi’s animated Lord of the Rings, and tells anecdotes involving Michael Jackson, Jack Kirby, and others. He also chronicles the legacy of APATOONS. Canadian animator-director Greg Duffell makes some candid remarks about animation producers. Anime expert Fred Patten celebrates the 26th anniversary of the Cartoon/Fantasy Organization, and how it helped introduce Japanese animation to the U.S. Veteran animation professional Bob Miller reports on what it’s like at a recording session for Disney’s Adventures of the Gummi Bears. He also interviews master designer Michel Gagné, who illustrated a beautiful cover just for us. El Paso, Texas researcher Andrew Leal reviews Pixar’s Finding Nemo and pays tribute to Ward Kimball, with filmography. An evaluation of cartoon directors. The Golden Age of Animation. The Future of Success by Robert Reich. Emergence: The Connected Lives of Ants, Brains, Cities and Software by Steven Johnson. Where Does Morale Fit Into a Budget? Director David Brain and storyboard artist Kelsey Mann share some splendid illustrated examples of their talents. Disney comics editor and Golden Age historian David Gerstein reviews The Barnyard Battle starring Mickey Mouse. Dewey McGuire reviews Robert McKimson cartoons. Emru Townsend contributes lists of the Worst Corporate Decisions, DVDs that Must Be Released if the Universe Is to Be Considered Fair and Just, and Best Cartoon Music Remakes. Voicemaster Keith Scott from Australia discusses his fascination with animation, his book, The Mouse That Roared, which details the history of the Jay Ward studio; and his performances in The Adventures of Rocky and Bullwinkle and George of the Jungle. The Moose That Roared is reviewed by Karl Cohen, and Scott is interviewed by Stephen Lynch. Warners historian Eric O. Costello discusses cartoons in their historical context. Cartoon Brew webmaster Amid Amidi discusses updating “Sorcerer’s Apprentice” and reviews The Powerpuff Girls Movie. Disney expert Jim Hill exposes what really happened with Robin Williams’ relationship with Disney, what Walt Disney REALLY thought of Fantasia, casting the voices for the gargoyles in Hunchback of Notre Dame. Guest contributor Ray Pointer discusses his restoration efforts for Ko-Ko the Clown. Voice actor Will Ryan discusses his creation, Elmo Aardvark, in web episodes produced by Renegade Animation. Luke Menichelli provides a complete listing of works by Osamu Tezuka published by Kodansha. All of this is just a small taste of the scholarship presented within APATOONS. 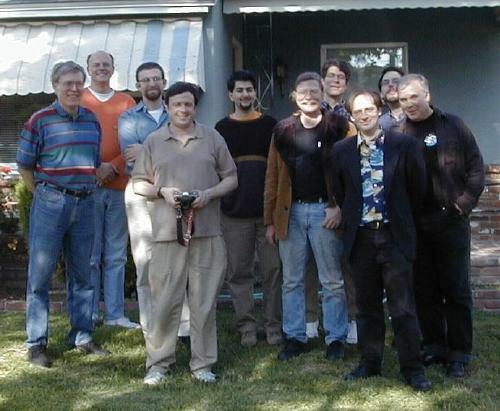 Group photo of Apatooners past and present, taken 4/15/00 in Burbank, California. From left: Honorary member Mike Barrier, Milton Gray, Daniel Goldmark, Bob Miller, Amid Amidi, Mark Kausler, David Bastian, honorary member Jerry Beck, Harry McCracken, and Will Ryan.